We live in a time when we are more aware than ever of the information stream around us. The data bloom has illuminated the dark places of our private and public spaces – the dark spaces of our heart and our world. It has gone from a whisper to a hurricane in less than a generation. The world around us appears more divided than ever before. But the information bubbles we live in are just visible tips of icebergs. We are not more divided, we just have more voices being let in to the debate. Of course the forces of the status quo are the loudest. They are the most resourced and educated. It’s their world we live in. And they are afraid we are going to take it away. But the dividend of the information revolution means that we can do more for less. We are not taking away their world. We are here to build a better world, together, for everyone. Even a poor person today lives a better, healthier life than the most wealthy of older times. So I believe that while there is digital static that is very visible in our transitional spaces – the places where the old connects with the new – there is also a communal coherence that is building – braiding together storytelling and service into a common choreography. The common choreography and the common song of humans. Humans living a free life of passion, purpose and pride. Of being in service to a community and now increasingly many communities at the same time that value a just and dignified human existence. And the more we engage, the more we give courage to others to add their voice and perspective to what constitutes a dignified human existence. Data does not discriminate but meta-data does – and the meta-data or labels we grew up with are crude, sparse and clumsy. They reflect the best understanding of the dominant human voices at the time. Now we see that we are not these simple labels – man, woman, black, white, old, young but much more shaded and nuanced and fluid. We are many things all at the same time. But there are other labels – the labels that connect us to common purpose and passion that allow us to form human communities. We are always in change and you can participate in this future by simply flipping your bit. Changing your attitude. Being prepared to come into a community and be of service to it. To build or change or make something better than we found it. By being in a community that inspires me to inspire others. I believe in you and me and we. Digital might be amplifying Babylon but it’s also creating different pathways and future we can choose from. More of us can tell stories, more of us can be of service. With purpose, we can build the future we want. We need to override the metadata labels we come with to see the human in each other and put ourselves to purpose. The life I live and the work I do is not disconnected anymore and the communities I can belong to are a thousandfold my parents. They say the future belongs to the young, but it’s just that the young are adaptable. They are curious and often get their hands burnt, but they learn and apply learning fast. And learning is hard. Hard and unsettling work. 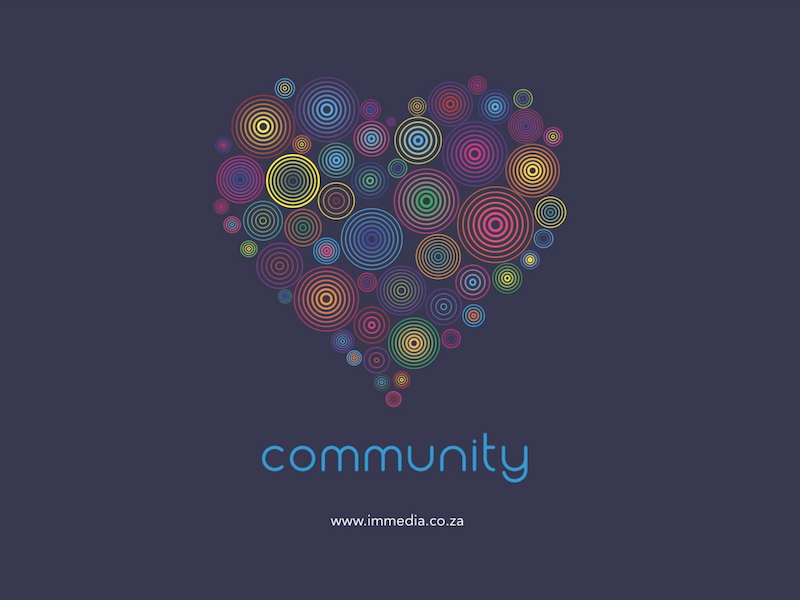 But as the last ten years and twenty-three and every year at immedia shows – we can and do learn very rapidly. We go out of our comfort zones, but it’s ok – I have a friend to lean on. The teams that will thrive in the future are the teams that can build trust together to learn, fail and get smarter together. That’s not what you know, it’s who you know in the most human sense. I can trust because my teammate has my back. But building that trust takes time, tolerance and teamwork. All day, every day, all our lives we exist and connect in communities and communities within communities – circles within circles. there are as many communities as there are humans interests and passions. And we are free to choose them, That’s true wealth. Having the freedom to work with people that inspire you and in a community in which you can inspire others. I have been fortunate enough to come into immedia every day for most of my adult life and be of service to this idea of immedia. And I do it because I love it. I love being in a team that accepts me and challenges me. I love being in a team urgent with purpose. I love feeling human emotions in the same place I work. But more importantly, I love looking back and seeing how we have inspired others to join in this labour of love. It is the privilege of a lifetime to look back and see that others have believed and trusted enough to join this community where I can connect my passion, pride and purpose. The great promise of the digital future is that where did not have a voice before, we do now. Where we could not choreograph before, we absolutely can now. One human can make a difference. You could be that human if you choose. Where will you make a difference? The work we do, the code we write, the solutions we create will affect real people, real human beings in real ways. We need and must join the fight for data privacy, data dignity and a value system that uses technology to include and empower all humans. This is not someone else’s problem, it’s not for some else to solve, volunteer or deal with. It’s ours for we are human. For the single, prime community we all belong in, is the human one.